I decided to conduct a spacing experiment with our spring broccoli in 2014. Most of my bed was planted at 18″ spacing for each plant. Part of the bed was spaced at 12″, per recommendations from Square Foot Gardening and Johnny's Selected Seeds. I grew the variety “Arcadia”. It had been bred to produce large heads, and numerous side shoots. It tolerates cold very well, but doesn't like the heat. 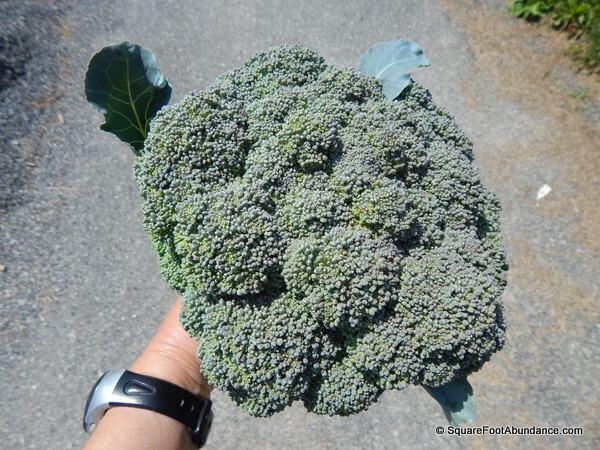 So it isn't the best variety for our spring crop, as the weather often gets pretty hot in mid-June when we harvest our spring broccoli – but it did well enough for us. 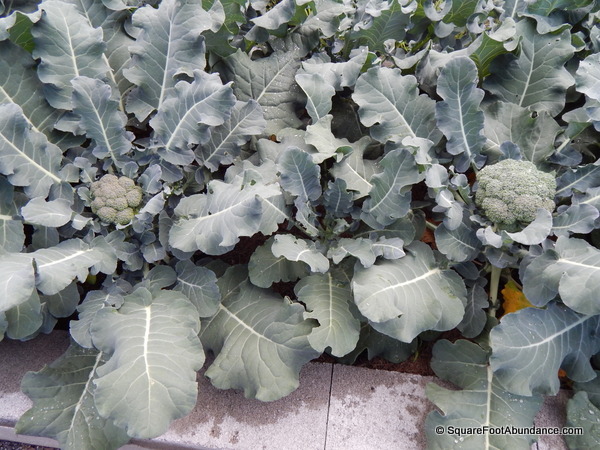 Broccoli plants, given good growing conditions, can grow quite large. My plants averaged 3 feet across. The plants grew very large. Most of them reached 3 feet across, so their leaves intermingled and overlapped each other. They seemed to tolerate the temps in the high 80's/low 90's fairly decently, though I think they might have done better in cooler temps. Some of the plants spaced 12″ apart lost the competition for light and became very stunted, and only produced tiny 1″ heads. The plants spaced 18″ apart didn't seem to stunt each other. However, unless I test wider spacing, I won't know how much more vigorously the plants could have grown. The broccoli heads from the 18″ spacing averaged 1.3 pounds each! Beautiful heads, as you can see. 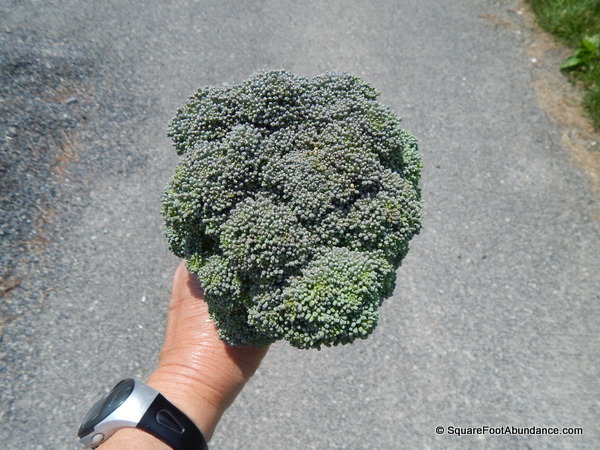 This is a single head of broccoli, weighing 1.5 pounds, and over 8″ across. Produced from a variety bred to grow large heads, given 18″ spacing and excellent growing conditions. The heads from the 12″ spacing averaged just 8.5 ounces each. Much smaller than the others. This was the largest head from the 12″ spacing. Many of the other heads from plants spaced 12″ were smaller – even as small as 1″ from some very stunted plants. However, the yield per square foot was very similar – 8.5 oz for 12″ spacing, and 8.3 oz for 18″ spacing. But the 18″ spacing only needed 40% of the plants needed for 12″ spacing. A 100 square foot bed with 12″ spacing needs 100 plants; the 18″ spacing would only need 40 plants. That's a major savings in starting or buying young transplants. So, my choice is to go with the wider spacing in my garden. This head is ready to harvest. The florets will separate when gently pressed apart. Have you always wondered when your broccoli head is ready to harvest? Pick your heads when the florets loosen up enough to be gently pressed apart. If they are too tight to spread when pressed, the head hasn't matured yet – it's certainly edible, but just hasn't reached maximum size yet. 2) giving them excellent growing conditions. Some varieties have been bred for larger-size heads. To grow to their maximum size, the plants need moist fertile soil, plenty of elbow room in the garden, and to be grown quickly. Any set-backs from dry soil or becoming pot-pound when young can stunt them for life. I replaced a couple of broccoli plants that had died young. But even though I had repotted a few young broccoli transplants into larger 1-quart pots while I waited to see if they would be needed as replacements, they still became pot-bound and they never grew well after they were planted in the garden. The broccoli plant in the middle of these 3 plants was pot-bound when planted in the garden. It never caught up to the size of its neighbors, and only produced a tiny 1″ head. They ended up only 1/4 of the size of the original plants, and they only produced tiny 1″ heads. They also had much more damage from pests than my large, healthy plants. Also, when you are planning how far apart to space your plants in your garden, remember that healthy broccoli plants can produce leaves that spread a full 3 feet across – from one side of the plant to the other. If you want to mix several types of plants in one bed, keep other plants at least 18″ away from each of your broccoli plants, and be aware that large broccoli plants will shade nearby smaller plants. There's nothing like harvesting fresh, delicious vegetables right outside your kitchen door! I've been passionate about organic gardening for over 40 years. Through this website and courses, I share how you, too, can harvest abundant organic food all year-round from small garden beds.